It was already close to evening after enjoying the view from the top of Eiffel tower or maybe I should say “half” top of Eiffel tower because the top of the tower was closed that day. So I was thinking we might as well spend the rest of the day near Eiffel tower and grab more pictures from it, especially the nightscape of it. I did not use my tripod for the night shoot of the Eiffel tower but instead, I used my ultra pod II for the long exposure. Of course, I have some difficulties adjusting the angle and height of my frame as the ball and socket is not as smooth as ballheads on tripod. Moreover, my camera was heavy. But I like the ultra pod for its sturdiness and the stability while capturing long exposures without any vibrations. I figured it out the best place to capture nightscape of Eiffel tower in my own opinion is at Esplanade du Trocadéro where I can have almost upfront view of the tower and there is also parapet where I can rest my ultra pod II with 5D II on. Once I have had my camera in place, I just keep clicking my shutter speed to a timer of 2secs each frame! I took several frames of different exposures and clips as well. Who knows when it will be the next time my visit to Paris is. I was acting in a way of Singaporeans do. It seems that most of the photography blog does not have much images of the man behind the camera and I realized mine doesn’t have much of my own photos. I hardly will get nice photos of myself as most of the time during traveling, it’s just me and Elaine, so it is always not so nice to just dump my bulky camera to Elaine and get her photographing me all the time! Unless time and space permit us to do that where we would spend more time relaxing and having fun doing shoots for each other. Here I am sharing the photos that we did of ourselves while taking in the gorgeous view of the iconic Eiffel tower in Paris. Tourists were everywhere and it is very tedious to photoshop the images. So I just leave it as it is, moreover, what is a traveling image without any tourists called? Superimposed! Although it was a cloudy afternoon, we had fun and of course, photos turned out to be not-so-bad after all. The images were done on 50mm f1.2 L and 16-35mm f2.8 L on 5D II. My trick? Set everything correct on the camera and passed it to Elaine, showed her how to focus correctly and press on the shutter release button. Done with 50mm f1.2 L on 5D II. 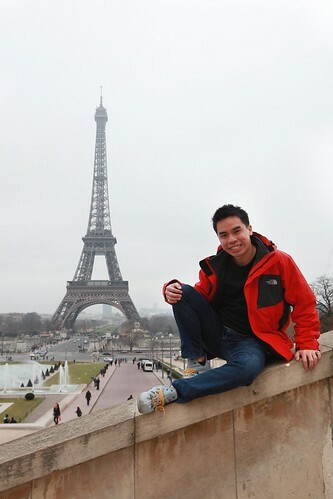 I was getting a little unglamorous here with climbing up literally on the parapet to get shots of myself with Eiffel tower. Elaine can’t get up on her own so I gave her a little help and that was well worth the effort. Guess what? After we left when I turned back, I noticed that others were following suit what we did to photograph themselves! Inspiring I am. Done with 16-35mm f2.8 L on 5D II. How nice it would be to be ice skating in the open with cold weather that is enough to sustain the ice for skating activities? And I mean real ice for ice skating, not any synthetic ice rink. Anyway, synthetic ice rink will never be anywhere as fun as real ice for skating. 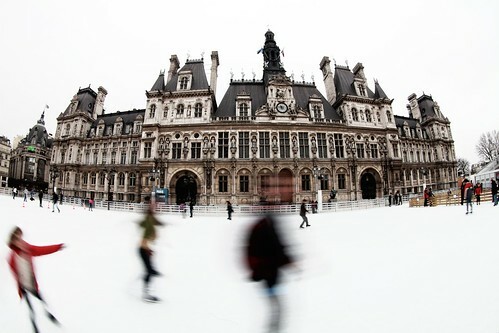 This ice skating rink which is available annually from December to March the next year, is located just outside of the place de l’Hôtel de Ville. Hôtel de Ville is a building that houses the Mayor’s office in Paris. This place is easily accessible by metro where the station is Hôtel de Ville metro station. I was standing around the parameter of the rink to get shots of this wonderful view with Hôtel de Ville as my background. I did my shot in a slow shutter on purpose to blur out the skaters around to at least not to show too much focus on the people when my main object is the skating rink and the building behind. I have done this with fisheye, I don’t think that this is possible with my UWA 16-35mm f2.8 to frame in the whole building. I did some photoshop editing as well to make this image a little to the morbid side. I also like how the white sky that is very cloudy at that time, matches the white ice skating rink on the foreground. This made the shot cleaner and somehow different. As the sky started to clear from a misty one, I quickly made my way from Notre Dam to Eiffel tower hoping to grab some images of the renowned tower, there is no way I am going back home without a photo of the glamorous Paris icon. It depends greatly on our luck as the time we were there was winter and the weather varies from misty and wet to a clear blue sky. Eiffel tower was never alone, it will always be packed with tourists and tons of tourists would queue up for hours to have a great view of the city from the top. Some would even walk up the steps to the top. 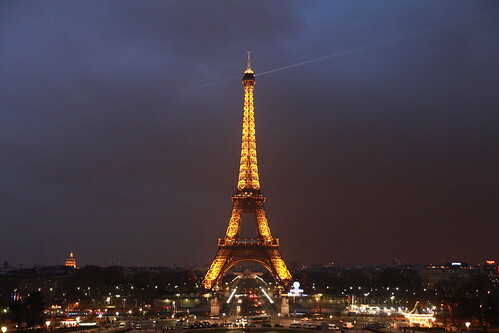 Getting up the Eiffel tower can be by elevator or simply walking up the stairs to the top. 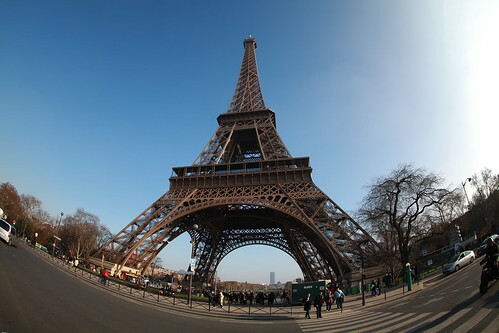 I had my fisheye on my 5D II and it was really fun to have a shot of the tower as the pictures of Eiffel tower from the internet were seldom taken by fisheye! Kudos to the beautiful weather that mother nature gave me on that day. I guess that it would be really great to visit Paris in the mid year when they have longer daylight so I can grab shots of Eiffel tower with few or even no tourists around early in the morning! 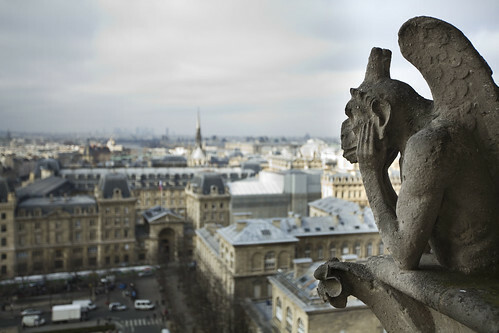 It is pretty exciting to have seen great pictures taken from Notre Dam in various websites. Most attention went to the gargoyle statues on top of the Notre Dam, overlooking the city which is kind of cool as I have never the opportunities to photograph images like these. I knew this will be my chance in Notre Dam, knowing that tripod will be very unlikely to be allowed in most of the indoors in Paris, I armed myself with 16-35mm f2.8 L and 50mm f1.2 L and climbed the stairs up. For the entry to Notre Dam, certain numbers of visitors are allowed at the intervals of 10 minutes. I guess this is to take the stress off the ancient building from the visitors. 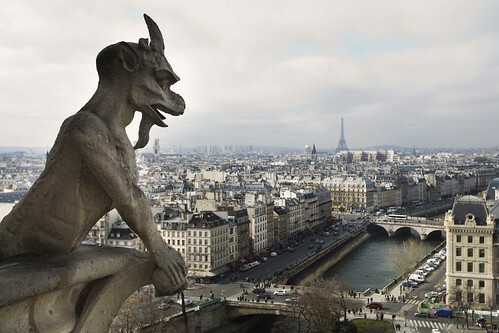 For the shots that I have taken during the visits, 16-35mm f2.8 L was definitely enough for grabbing shots of the gargoyle statues overlooking the city. The images below are the ones that I have captured with 16-35mm f2.8 L on 5D II. I have balanced out the exposures of the foreground and the background. This trip to Notre Dam is definitely worth a visit and the effort to walk up the long spiral stairs. Please don’t look forward to an elevator or escalator in this building, you will only find yourself taking the stairs and that is for sure. The image below was taken with smaller aperture of f5.6 to reduce the bokeh and to reveal the scenery of the city, especially the renowned Eiffel tower. Cropping was also done to fit the statue nicely into the frame. One of the visits that I have to do and I must do is the Louvre museum. 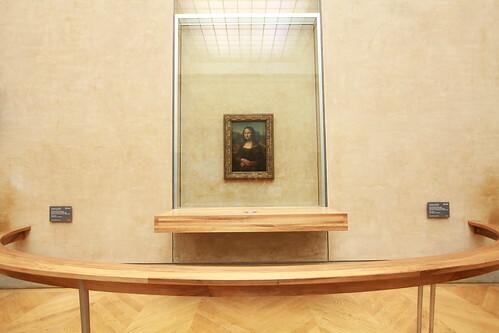 One is for its pyramid shape glass structures and also for Monna Lisa. I have long heard this name ever since I was a kid and I have no idea of the real size of this beautiful painting until I took a visit to Paris. This is my first visit to Paris and the visit to Louvre museum is of course, utmost important to me as a tourist! We took a very early train up to Eiffel tower and walked by foot from there to Louvre museum. It was cold so the walk so easy and indeed, no sweat! My photo that I shared below have no editing done, what’s there to adjust anyway. Fortunately, the crowd was not yet that big in the morning when I went there, and so I managed to wait for my turn and stand myself directly in front of the legendary painting that I have always wanted to see with my own eyes! After taking a good 10 minutes view of the painting, I started clicking away with various frames. I don’t want to miss that chance and I knew it would be more difficult to get back to this position to take pictures again. Finally, I am sharing this image on my own blog, such a wonderful feeling. 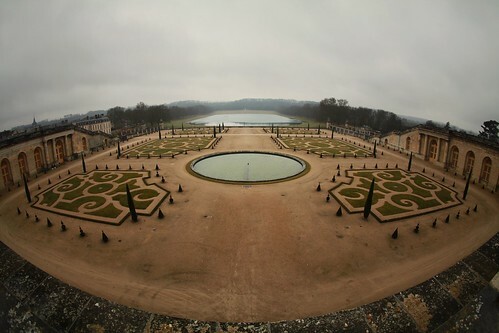 I don’t really have any great impression of Château de Versailles before I visited the place, everything has changed ever since after. I knew earlier from documentary variety shows that this place has really beautiful garden to stroll in and is huge. Getting there is easy. Trains do serve the station there where you have to walk to Château de Versailles by foot for another 400meters approximately. When we finally got there, we were simply taken in by its beauty from the outside. You can see tourists already grabbing shots at the main golden gate! 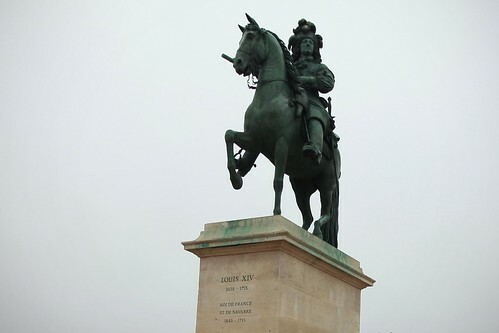 The first shot that I’m going to share is the one I took of the Louis XIV statue. I have increased the contrast and also cropped away the unwanted objects in the image. 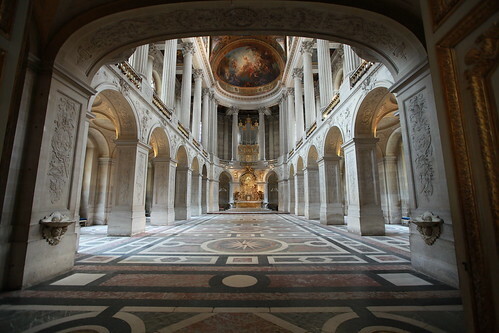 After you have the seen the grand entrance of Château de Versailles, you will definitely want to have a peek inside to see how gorgeous it is. We reached there at a very early time, earlier than the normal time the tour groups would start their tour at. So I quickly took the chance to snap a shot with anyone in my frame but my main object! It will not be my very ideal shot if I have tourists as well taking shots of the entrance in front of me putting themselves inside my frame. I love my shot to be clean and neat and evenly proportioned. 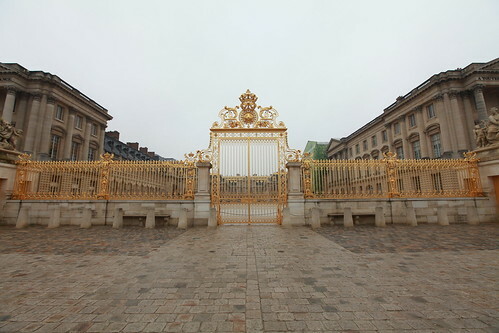 For the shot below, is the golden entrance gate of Château de Versailles which is not opened, you only enter the premises by another entrance at the side where you have to be scanned for any dangerous items that can cause damage to the architectures. Once inside, with the ticket that we purchased from ticket counter in Gare Du Nord train station, we could get a device which is the recorded guide to self guide ourselves around the various grand apartments and halls. I guess I would get lost and lose interest in the architectures if I do not have the recorded guide to show me around. 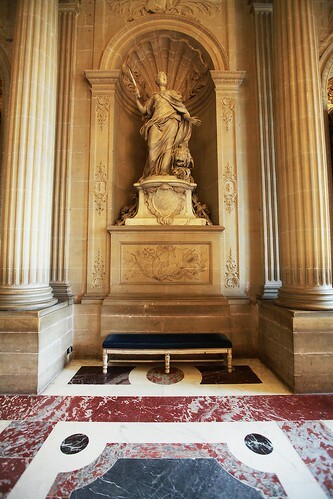 The image that is shown below is a shot that I took of the Royal Chapel. I shall not go into history details as I would love to keep my post short and sweet. Getting the shot of the Royal Chapel is not easy without DSLR in my opinion because of the low light and the crowds of tourists around that will hinder your way while taking their pictures as well. No editing was done at all for this picture below. I can say that I was quite mesmerized by the internal architectures of Château de Versailles but the amount of lights inside was not really favorable to my photography opportunities. I have few photos that I like and want to show but not many as I dislike a picture with bad composition, well, at least in my own judgement. The following shot was one that I would like to share here. I have increased only the contrast for this image and untouched others. For the final image that I want to show is the gorgeous garden. Several parts of the garden were closed to visitors at that time for maintenance. Moreover, there were few visitors at that point of time so I can take a relaxed walk around and taking pictures without crowds around. It was a cold weather outside, that could be a part of the reason why few visitors will visit that place.